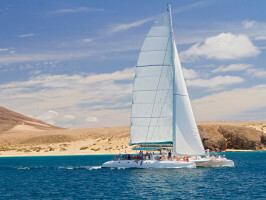 We sail from Puerto Calero to the beautiful Papagayo beaches. There we anchor for 2.5 hours approximately, so you can swim, take a spin on our powerful jet ski, Snorkeling equipment, including find, masks and snorkels are available for the clients use. A very personal and professional service given by our crew of three. The excursion is 5.5 hours long and we will sail weather permitting as much as possible. 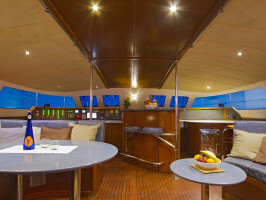 Services on board include: On arrival the clients receive a glass of Moet Chandon. During the sailing we serve tapas of local cheese, olives, dried fruit nuts etc… Lunch at Papagayo is smoked salmon, salad, Serrano ham, fresh pasta, bread and butter. It is an open bar serving beer, soft drinks, white wine from the island and an excellent red wine from the Ribero Del Duero. Fresh fruit and local cheese is served as dessert. 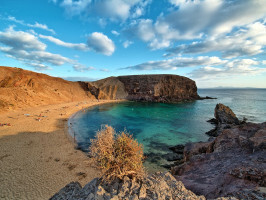 We offer a choice of the Jet Ski with our monitor, or the zodiac to take people to the beach at Papagayo. Meeting point: Customers in Arrecife and Puerto Calero hotels must go directly to the Local 1 in Puerto Calero Marina. Duration: About 5 and half hours. Start or opening time: Flexible, recommended time from 11am to 4:30pm. 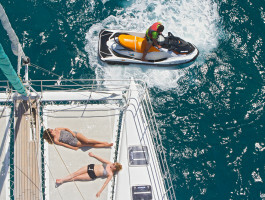 Included:catamaran exclusive, personal service, Champagne reception, swim, snorkel, jet-ski or RIB, freshly prepared lunch, Chill-out music and experienced crew. Other information: Remember to bring a bathing suit, towel and sun cream. 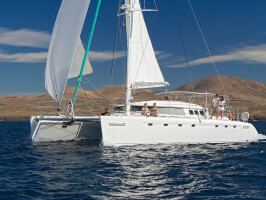 Please exchange your voucher at: Puerto Calero Marina, Local 1 - Catlanza office, 35571 Macher, Lanzarote. Redeem point opening hours: 09:00am to 05:00pm. Opening days/period: from Mondays to Saturdays. Voucher validity: This voucher can be exchanged only once and misuse is considered a criminal offence.